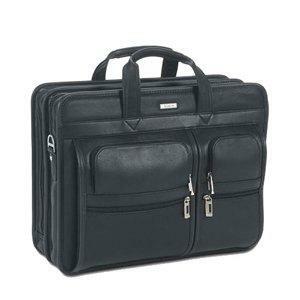 The SOLO / U.S. Luggage Full Grain Leather Computer Portfolio has a gusseted front compartment with four zippered pockets and an organizer in the front zippered pocket that contains business card holder and pen loops. The large back compartment has a three-tier accordion fan file, while the main compartment contains a removable padded computer pocket. Today's highly mobile professionals and students have individual needs and are more style conscious. The SOLO collection continues its long tradition of innovation by creating business luggage/briefs/attaches that reflect consumers' busy lifestyles. New features make business travel easier, and U.S. Luggage offers unparalleled value and customer service. Features include: open leather straps on the back of the case which hold newspapers or an umbrella, cushioned carry handles, a removable/adjustable shoulder strap, a removable, padded, computer pocket that holds 15.4" laptop, and a three-tier accordion fan file. Dimensions: 16.50" x 13" x 6" Materials: Leather. Weight: 4.2 lbs. 5 Year Limited Warranty.